Jujutsu is a parent art of Japanese origin meaning the combat art of suppleness/pliancy, flexibility and adaptability. In general, a method of using the body as a weapon and with weapons for combat. Jujutsu was first thought to be promoted by Shinra Saburo Yoshimitsu around 10 to 1100. Yoshimitsu was thought to have devised much of his technique after watching a spider trap a large insect in its web. Yoshimitsu’s house “Daito Mansion,” gave way to the name later becoming Daito Ryu Jujutsu (Aikijutsu). This art was a family art only, until Sokaku Takeda taught to outsiders. The most well known student of Takeda was Morehei Ueshiba, the founder of modern day Aikido. 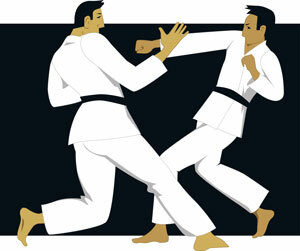 Jujutsu is also known to be the parent art of both Judo and Aikido. Over the long history of Jujutsu many styles evolved and were the influences of some Aikido and Judo techniques. A few of the systems that have influenced technique of Aibukan Budo at the Aibukan Dojo are; Tenshin Shinyo Ryu, Kito Ryu, Daito Ryu, Fusen Ryu, Danzen Ryu and Yoshin Ryu No Kai.